Trichinellosis is a meat-borne zoonotic disease caused by parasites of the genus Trichinella. To date, 12 taxa have been described. The identification of Trichinella species is crucial in order to identify the possible source of infection, the geographical origin of the parasite and to assess risk of infection for domestic pigs and humans. Specific identification of the etiological agent is not always feasible using direct methods since the source of infection can be untraceable. 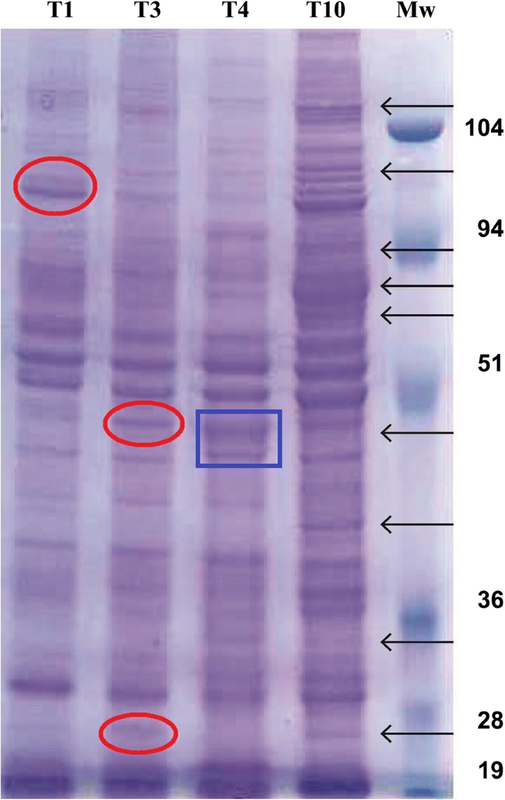 The aim of this study was to develop a diagnostic tool to infer the causative Trichinella species using western blot patterns of sera derived from infected animal and human hosts. Sera from mice experimentally infected with Trichinella spiralis, Trichinella britovi, Trichinella pseudospiralis and Trichinella papuae were tested by western blot using homologous and heterologous crude worm extracts (CWE) and a highly sensitive detection system based on chemiluminescence. In addition, sera from pigs experimentally infected with T. spiralis, T. britovi and T. pseudospiralis and from patients with confirmed T. spiralis, T. britovi and T. pseudospiralis infections, were also included. 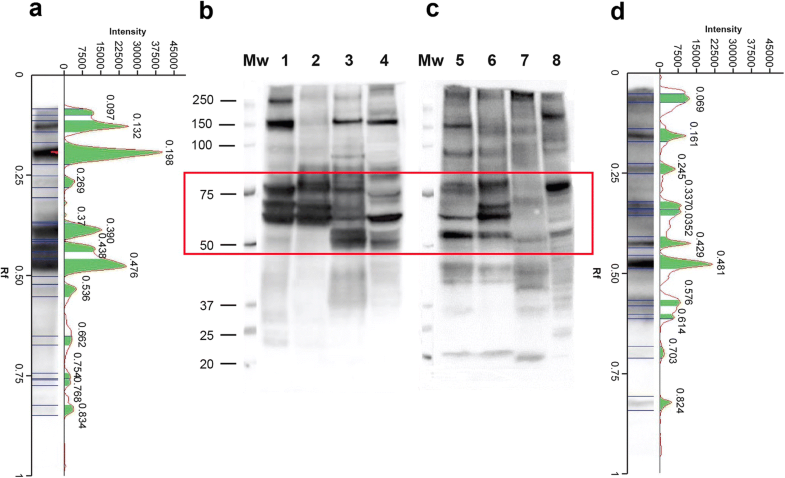 Sera from mice infected with one Trichinella species reacted with CWE proteins from all four investigated species. Likewise, sera derived from pigs and humans infected with one Trichinella species reacted with CWE proteins from all the three investigated species. Using T. spiralis CWE, sera from T. pseudospiralis-infected hosts yielded a characteristic pattern of reactivity using Wb, which differed to that produced by T. spiralis/T. britovi- or T. papuae-infected host sera. The present study suggests that western blot using T. spiralis CWE may be a useful tool to distinguish Trichinella infections caused by T. pseudospiralis from those caused by T. spiralis or T. britovi. This method may support epidemiological investigations, particularly when the source of infection is not traceable. Trichinellosis is a meat-borne zoonotic disease caused by parasites of the genus Trichinella. To date, 12 taxa are known, including the encapsulating species Trichinella spiralis, Trichinella nativa, Trichinella britovi, Trichinella murrelli, Trichinella nelsoni, Trichinella patagoniensis and genotypes Trichinella T6, T8 and T9 exclusive to mammals, and non-encapsulating species Trichinella pseudospiralis, Trichinella papuae and Trichinella zimbabwensis infecting mammals and birds or mammals and reptiles . The most common source of infection for humans is raw pork but raw meat and meat-derived products from other omnivores (e.g. wild boar), carnivores (e.g. bear, cougar, fox, badger, jackal, walrus and dog) and a herbivore (i.e. horse), were also identified as important sources of infections . The severity of trichinellosis in humans can range from subclinical to fatal. However, given that no pathognomonic signs or symptoms exist, infections that are suspected based on the clinical picture and laboratory findings should be serologically confirmed through the detection of anti-Trichinella IgG . Currently, ELISA as a primary screening test and Western blot (Wb) as a confirmatory assay based on excretory/secretory antigens (ESA), are the most commonly used tools to diagnose human trichinellosis [3, 4] and to monitor Trichinella spp. infection in animals [5–8]. Animal hosts can harbour infective muscle larvae (ML) before antibodies can be detected, therefore serological methods should not be used for the surveillance of Trichinella infection in food animals. Nevertheless, ELISA can be used to monitor infection in domestic pigs and wildlife populations; however, a confirmatory test, such as Wb, should be performed to confirm ELISA positive sera . ESA originating from larval secretions consist of a group of structurally related glycoproteins, which contain a predominant antigen epitope recognized in animals and humans infected with T. spiralis, or any of the other taxa of Trichinella currently known . Consequently, tests utilizing ESA can detect infection caused by any of the known Trichinella taxa, but are unable to provide species-specific identification. The identification of the Trichinella taxon is crucial in order to determine the possible source of infection, the geographical origin of the parasite and to assess potential risk of infection for domestic pigs and humans. Additionally, species identification of the etiological agent is not always feasible using direct methods since the source of infection can be untraceable. Four Trichinella species (T. spiralis, T. nativa, T. britovi and T. pseudospiralis) are known to occur within the European Union (EU). Trichinella nativa is restricted to wild carnivores of arctic and subarctic regions and few cases of human infections were documented in the EU due to imported bear meat or bear meat consumed abroad [11, 12]. In contrast, T. spiralis, T. britovi and T. pseudospiralis are widely distributed within the continent with varying prevalence rates depending on animal species (swine versus carnivores) and husbandry conditions [13, 14]. The objective of the present study was to develop a diagnostic tool to differentiate between Trichinella species causing infection in animals and humans, based on the protein band pattern of reactivity of the host serum sample versus Trichinella spp. antigens using western blot. Samples were collected at 45 days post-infection (dpi) from 28 CD1 mice, which had been infected with 200 larvae/mouse of T. spiralis (five mice), T. britovi (five mice), T. pseudospiralis (five mice), T. papuae (five mice), T. nativa (one mouse), T. murrelli (one mouse), Trichinella T6 (one mouse), T. nelsoni (one mouse), Trichinella T8 (one mouse), Trichinella T9 (one mouse), T. zimbabwensis (one mouse) and T. patagoniensis (one mouse). All mice had tested positive for the presence of anti-Trichinella IgG by ELISA and Wb using T. spiralis ESA. Sera were also collected 65 dpi from 15 domestic pigs, which had been infected with 10,000 larvae of T. spiralis (five pigs), T. britovi (five pigs), and T. pseudospiralis (five pigs) and had tested positive for the presence of anti-Trichinella IgG by ELISA and Wb using T. spiralis ESA. A total of 14 human sera obtained from five patients with confirmed T. spiralis infections acquired during a horsemeat outbreak , five patients with confirmed T. britovi infections acquired during a wild boar meat outbreak  and four patients with confirmed T. pseudospiralis infections sustained during a wild boar meat outbreak  were included in this study. All 14 human sera had tested positive for the presence of anti-Trichinella IgG by ELISA and Wb using T. spiralis ESA. The diagnosis of trichinellosis was based on the algorithm proposed by Dupouy-Camet & Bruschi . The 20 murine, 15 porcine and 14 human sera yielded the three band patterns characteristic of Trichinella infection using Wb . Muscle larvae (ML) were collected from mice, which had been infected three months earlier with 500 ML of T. spiralis and T. britovi, thus representing the group of encapsulating species, and T. pseudospiralis and T. papuae illustrative of those not able to induce capsule formation. ML were collected by HCl-pepsin digestion. Following digestion, ML were washed several times using 0.1M phosphate buffered saline pH 7.2 (PBS), and were then stored at -70 °C in the presence of protease inhibitors (Sigma-Aldrich, Saint Louis, MO, USA). After four thawing/freezing cycles, ML were crushed in a glass Potter homogenizer using a Teflon pestle, and further disintegrated by sonication. The larval suspension was maintained overnight at 4 °C with magnetic stirring and centrifuged for 1 h at 13,000× g at 4 °C. The protein concentration of the supernatant was determined by the Bradford method. Three different CWE batches were prepared for each of the four Trichinella species. An in-house ELISA was used in accordance with previously published protocols [18, 19]. Murine, porcine and human sera were diluted 1:100, 1:50 and 1:200, respectively. Peroxidase-labelled anti-mouse IgG or anti-swine IgG was diluted 1:30,000, whereas peroxidase labelled anti-human IgG was diluted 1:50,000 (Kierkegaard and Perry Laboratories, Gaithersburg, MD, USA). The optical density (OD) was obtained by reading the reaction at 450 nm using an ELISA plate microtiter reader (Dynex Technologies, Chantilly, VA, USA). Murine, porcine and human sera were diluted 1:100 and tested by Wb using a highly sensitive detection system based on chemiluminescence . Sera with an ELISA OD value higher than 1.5 were also tested at a dilution of 1:500. Briefly, 150 μg of T. spiralis, T. britovi, T. pseudospiralis and T. papuae CWEs were diluted and loaded in 10% pre-cast NuPage Novex Bis-Tris Gels® (Life Technologies, Carlsbad, CA, USA) as reported in the instructions for electrophoresis using the XCell SureLock® Mini-Cell (Life Technologies). Proteins were electrophoretically separated under reducing conditions and transferred to nitrocellulose (Bio-Rad, Hercules, CA, USA) at RT for 1 h. The nitrocellulose filters were blocked with 5% skimmed milk in 1× Tris Borate Saline Tween (TBST, 50 mM Tris pH 8.0, 150 m NaCL, 1% Tween 20) at 4 °C overnight and washed three times with 1× TBST. Nitrocellulose filters with T. spiralis CWE were cut into strips, each of which was then incubated with 1:200 mouse, 1:500 porcine or 1:400 human sera with 3% w/v skimmed milk (Sigma-Aldrich) in 1× TBST at RT for 1 h. After washing three times with 1× TBST, the strips were incubated for 1 h with a 1:2500 dilution of goat anti-mouse IgG, or a 1:3000 dilution of goat anti-pig IgG, or a 1:10,000 dilution of goat anti-human IgG, conjugated with horseradish peroxidase (Bio-Rad). To reveal proteins with high efficiency, the LiteAblot® Plus chemiluminescence system (Euroclone, Pero, Milan, Italy) was added to the strips for 5 min. The proteins were then visualized on a ChemiDoc™ XRS System (Bio-Rad) and images were analysed using the Image Lab™ software version 4.0 (Bio-Rad). Each individual serum was tested three times by Wb using three different CWE batches. The protein profile patterns of the three CWE batches within the same species run by SDS-PAGE were identical (data not shown). The CWE profiles of T. spiralis and T. britovi showed some differences in band intensity: (i) a more intense 96 kDa band in T. spiralis CWE than in T. britovi CWE; and (ii) more intense 45 kDa and 23 kDa bands in T. britovi than in T. spiralis CWE (Fig. 1, red circles). Differences in the protein pattern were detected between encapsulated (T. spiralis and T. britovi) species and the non-encapsulated T. pseudospiralis and T. papuae. The protein profile of T. papuae appeared to be the most different from the other three CWE profiles (Fig. 1). Proteins of T. pseudospiralis produced a different electrophoretic pattern than that of T. spiralis or T. britovi, despite having similar molecular weights (Mws; 45 and 43 kDa; Fig. 1, blue box). Sera from mice infected with a given Trichinella species reacted with CWE from the other three species by Wb; however, the patterns of reactivity were different for both band intensity and presence/absence of bands (Fig. 2). Sera from T. spiralis-infected mice reacted with the four CWEs showing bands from 60 to 150 kDa. However, bands from 23 to 42 kDa were observed only when sera were blotted with T. spiralis and T. britovi CWEs (Fig. 2a, Lanes 1 and 2). The reactivity patterns of T. spiralis and T. britovi CWEs with a T. spiralis-infected murine serum displayed different signal intensities (Fig. 2a, Lanes 1 and 2); the pattern of reactivity of the same serum sample with T. pseudospiralis and T. papuae CWEs showed signals of different intensities for bands above 50 kDa and the absence of bands below 50 kDa (Fig. 2a, Lanes 3 and 4). Sera from T. britovi- and T. papuae-infected mice displayed very similar reactivity patterns, when they reacted with the CWEs of encapsulated (Fig. 2b, d; Lanes 1 and 2) and non-encapsulated species (Fig. 2b, d; Lanes 3 and 4). Sera from T. spiralis-, T. britovi- or T. papuae-infected mice reacted with T. spiralis CWE showing a similar profile (Fig. 2a, b, d; Lane 1). This differed from the pattern seen for sera samples from T. pseudospiralis-infected mice with T. spiralis CWE (Fig. 2c, Lane 1). Moreover, sera from T. pseudospiralis-infected mice reacted with T. spiralis, T. britovi and T. papuae CWE proteins yielding a band pattern (Fig. 2c, Lanes 1, 2 and 4) which differed from those produced by sera of mice infected with the other species (T. spiralis, T. britovi and T. papuae) with the same CWE (Fig. 2a, b, d). As shown in Fig. 3, the reactivity patterns of T. pseudospiralis and T. spiralis sera with heterologous and homologous CWEs, yielded different profiles. Looking at the relative mobility (Rf) and at the signal intensity of T. spiralis CWE proteins recognized by mouse sera, the highest differences were detected from 50 to 100 kDa (Fig. 3, red boxes). The Rf of T. spiralis CWE reacting proteins with a representative T. spiralis mouse serum were 0.470, 0.450, 0.424, 0.378, 0.345, 0.301, 0.271 and 0.219 mm, whereas the Rf of T. spiralis CWE reacting proteins with a representative T. pseudospiralis mouse serum were 0.508, 0.466, 0.426, 0.380, 0.331, 0.268, 0.249 and 0.234 mm. Each T. spiralis or T. pseudospiralis mouse serum sample generated a “fingerprint” of its own identity. Given that T. spiralis is the species generally maintained in laboratory mice and used to produce antigens for the serological detection of Trichinella species, we focused on the reactivity of sera from pigs infected with T. spiralis, T. britovi and T. pseudospiralis with T. spiralis CWE. 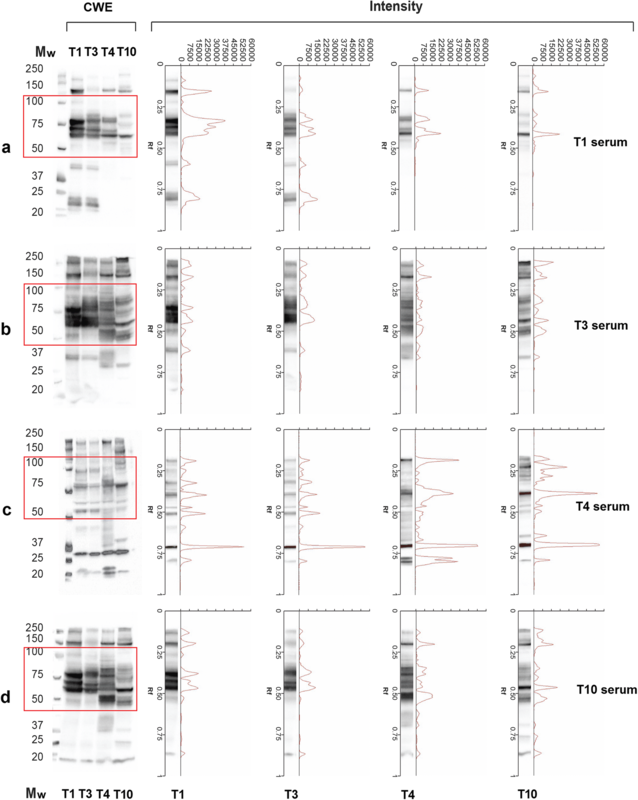 Sera from T. spiralis- and T. pseudospiralis-infected pigs reacted with T. spiralis CWE showing different protein profiles mainly in the range of 50 to 75 kDa. In this Mw range, the Rf of T. spiralis CWE reacting proteins with three representative T. spiralis-infected pig sera were 0.471, 0.428, 0.393, 0.376, 0.341, 0.289 and 0.243 mm, whereas the Rf of T. spiralis CWE reacting proteins with three representative T. pseudospiralis-infected pig sera were 0.483, 0.445, 0.355, 0.350, 0.338 and 0.220 mm (Fig. 4, red box). Sera from T. britovi- and T. spiralis-infected pigs showed the same reactivity pattern with T. spiralis CWEs (data not shown). Sera from five patients infected with T. spiralis and four infected with T. pseudospiralis reacted with the CWE of the other species displaying different reactivity patterns (Fig. 5a). For example, the reactivity of T. spiralis CWE was qualitatively different when blotted with a T. spiralis than with a T. pseudospiralis infected serum sample (Fig. 5a, Lane 1; Fig. 5b, Lane 5). The pattern of reactivity of T. spiralis CWE with sera from four T. pseudospiralis-infected individuals is shown in Fig. 5b, Lanes 1–4. The highest differences were observed from 50 to 75 kDa; the Rf of T. spiralis CWE reacting proteins with representative T. spiralis and T. pseudospiralis human sera were 0.484, 0.448 and 0.397 mm, and 0.486, 0.436, 0.360 and 0.355 mm, respectively (Fig. 5a, red boxes on Lanes 1 and 5). Human T. britovi-infected sera showed the same pattern of reactivity as that of T. spiralis-infected patients with T. spiralis CWE (data not shown). The present study demonstrated that western blot using T. spiralis CWE can be a useful tool in distinguishing between infections caused by T. spiralis or T. britovi from those caused by T. pseudospiralis. This test is of potential significance for clinical and epidemiological studies, particularly when the source of infection is not traceable. Moreover, since T. spiralis is the species generally used for antigen production to detect infections with any species of Trichinella, the proposed test will be affordable for most laboratories working in human and animal serology. Under the experimental conditions used in the present study, a clear pattern of T. spiralis CWE reacting proteins able to distinguish between T. spiralis-, T. britovi- and T. papuae-infected sera was not defined. Encapsulated and non-encapsulated species of the genus Trichinella diverged from their most recent common ancestor about 21 million years ago (mya), with taxon diversifications commencing 7–10 mya . Biochemical and immunological differences among the species are well documented [20–23]. However, most of these studies focussed on T. spiralis and T. pseudospiralis showing substantial differences in the inflammatory response and modulation of the muscle cell phenotype [24–31], in larval and adult size , naked larva kinesis , morphology of the stichocyte granules  and protein content [33–38] and therefore highlighted discrepancies in immunological properties [39–42]. Differences in the electrophoretic protein patterns of T. spiralis and T. pseudospiralis have been reported by several authors. Rodriguez-Perez et al. showed that the electrophoretic reactivity pattern of T. pseudospiralis CWE with a monoclonal antibody displayed fewer protein bands than that of T. spiralis CWE with the same serum. Wu et al. 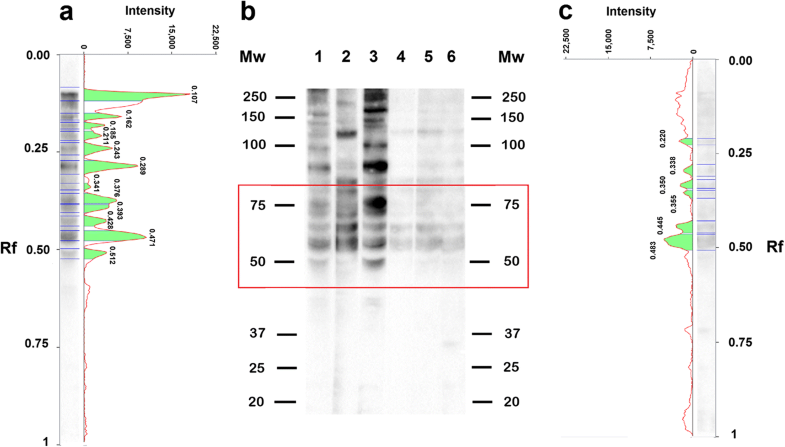 using homologous murine infected sera revealed 100 and 20–30 antigenic peptide spots in T. spiralis CWE and T. pseudospiralis CWE, respectively, by two-dimensional Wb, despite the similar level of total protein content in both extracts. These authors concluded that T. pseudospiralis has a lower immunogenicity than T. spiralis . In the latter study, the immunostaining of T. pseudospiralis CWE with homologous murine infected sera were weaker than those of T. spiralis CWE with its respective murine infected samples. Our results confirm these differences both in the number of antigenic proteins (bands) and in their reaction intensity (Fig. 2a, c; Figs. 3, 4 and 5), highlighting once more the lower immunogenicity of T. pseudospiralis in comparison to that of T. spiralis [24, 40, 42, 44]. Differences in pathological changes in the host caused by T. spiralis and T. pseudospiralis have been attributed to the diversity of their excretory/secretory products [37, 38]. However, it is known that T. spiralis and T. pseudospiralis share ESA with considerable similarity, with some being identical in terms of cDNA sequence, deducted molecular mass and antigenicity [34, 36, 45, 46]. Trichinella spiralis ESA show two main proteins, those migrating at about 43 kDa and those migrating at about 53 kDa [47, 48] and homologous proteins were observed in T. pseudospiralis. However, the comparison of the amino acid sequence of the 53 kDa of T. pseudospiralis with the corresponding one in T. spiralis revealed less than 68% homology. An antibody against the 53 kDa recombinant protein of T. spiralis recognized this protein in CWE from adult worms, and in the ESA from T. spiralis muscle larvae, but it did not recognize any protein in T. pseudospiralis [37, 49]. The results of the present work are based on CWE, which, besides containing ESA, has many more proteins. 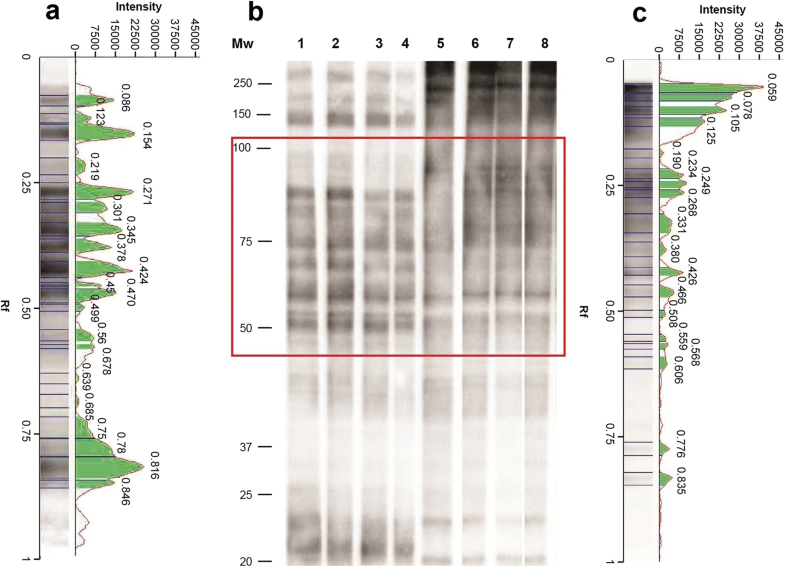 This protein rich-pool has allowed us to distinguish between Trichinella taxa based on the different patterns of reactivity of the native proteins present in the CWEs, with homologous and heterologous sera as described in this study. However, T. spiralis ESA can detect infections caused by any of the known Trichinella taxa , and it is more specific but less sensitive than CWE, having a great utility to differentiate Trichinella infections from those caused by other pathogens. Recently, the immunogenic proteins from somatic muscle larval extracts of T. spiralis, T. pseudospiralis and T. papuae were compared by immunoblotting and mass spectrometry. After immunoblotting with pooled human sera, 17 proteins ranging from 33 to 67 kDa, which were associated with important molecular functions and biological processes of the parasite, were selected for identification. As expected, some proteins were found to be shared among the investigated species whereas other proteins were species-specific . Differences observed at the molecular level create a characteristic pattern of reactivity for the native proteins present in the CWEs with sera from different Trichinella-infected hosts. This has allowed the inference of the etiological agent (T. spiralis/T. britovi versus T. pseudospiralis) of infection. The precise determination of the proteins involved in these differences in terms of molecular weight or the relative electrophoretic mobility was not within the scope of this work. However, each serum sample from T. spiralis/T. britovi- or T. pseudospiralis-infected host yielded a “fingerprint” of its own identity when it was blotted with T. spiralis CWE (Fig. 6). Under the experimental conditions used in this study, a diagnostic pattern was defined for T. spiralis/T. britovi- and T. pseudospiralis-infected hosts. The present results may be useful in the epidemiological context of the European Union, but some of the experiments using T. papuae clearly show the potential of this diagnostic method in differentiating between Trichinella species infecting animals and humans from Southeast Asia, where T. spiralis and T. papuae occur sympatrically. Wb of T. spiralis CWE with serum samples from mice infected with all the 12 Trichinella taxa recognized so far, show similar protein patterns excluding the T. pseudospiralis-infected mouse serum, which can be easily distinguished by other patterns (Additional file 1: Figure S1). These Wb patterns also show several different bands; however, additional investigation carried out with serum samples from other host species are required to study these differences and to use them as diagnostic tools. The present study suggests that Wb using T. spiralis CWE may be a useful tool to distinguish Trichinella infections caused by T. pseudospiralis from those caused by T. spiralis or T. britovi. This method may support epidemiological investigations, particularly when the source of infection is not traceable. We are grateful to Massimo Delle Femmine and Gianluca Marucci for their invaluable support in the preparation of the figures. We kindly thank Belgees Boufana for reviewing the manuscript. This work was supported by the European Commission, contract SANCO/2006/FOOD SAFETY/032 and by the Italian Ministry of Health: Azioni Centrali, Programma CCM 2016 “Analisi epidemiologica di tre malattie infettive orfane: Trichinella, Listeria, Echinococcus”. The data supporting the conclusions of this article are included within the article and its additional file. Raw data presented are available at the Istituto Superiore di Sanità upon request to the corresponding author. MAGM designed the study, performed data analysis and contributed to writing the article. AL and MA performed the ELISA and Western blot analyses. SC and DT prepared the Trichinella spp. crude antigens. EP contributed to designing the study and to writing the article. All authors read and approved the final manuscript. Mice and pigs were housed and treated according to the European directive on laboratory animal welfare (European Commission, 2010 and L.D. 26/2014) and the protocols were approved by the Italian Ministry of Health (DL 116/92 and 11/2016 UT, respectively). All of the human participants provided informed consent to have blood samples drawn. International Commission on Trichinellosis. Recommendations for Serology. 2018. http://www.trichinellosis.org/uploads/ICT_Recommendations_for_Use_of_Serological_Methods_3-20-18.pdf. Accessed 23 June 2018. Dupouy-Camet J, Yera H, Dahane N, Bouthry E, Kapel CM. A cluster of three cases of trichinellosis linked to bear meat consumption in the Arctic. J Travel Med. 2016;23. https://doi.org/10.1093/jtm/taw037.